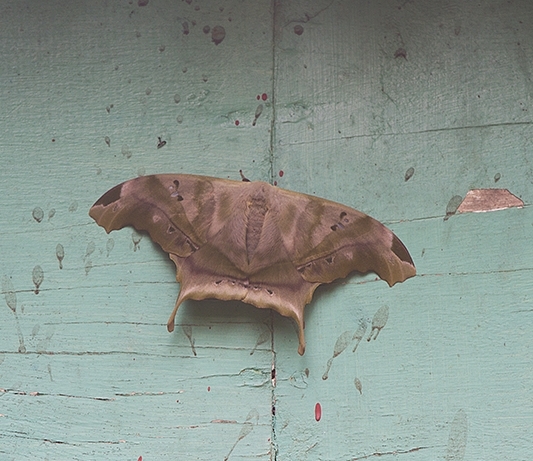 The Question: We saw many moths and butterflies in La Selva Verde in Costa Rica. This big one has a strange structure! Can you help us with finding a scientific name? The Short Answer: This is Titaea tamerlan, one of the group of moths known as silk moths (Saturniidae). It is found in Central and South America, from Mexico to Peru. The projections at the bottom of the wings identify this as a male. The family Saturniidae contains the world’s largest moths, and Titaea tamerlan is a good representative, with females about 12.5 cm (5 in.) across and males a bit smaller. After mating, females lay 5-10 eggs on the undersides of leaves of trees in the mallow family (Malvaceae), including the kapok tree (Ceiba pentandra), silk floss tree (Ceiba speciosa), and pachote (Pachira quinata). The eggs hatch about six days later and the caterpillars feed on the tree leaves. Over the course of about a month, the caterpillars go through several dramatic changes, beginning thin and spiky and ending plump and smooth. (To see the various stages, you can click here to go to a website that features Costa Rican butterflies and moths.) Eventually, the caterpillars burrow into the ground, where they pupate and later emerge as adult moths. The adult moths only live 6-9 days and don’t eat at all. Moth or Butterfly: If you’re not sure whether something is a moth or a butterfly, the easy answer is that they are all moths. If you look at the evolutionary tree of the Lepidoptera, the insect order that includes both moths and butterflies, you will see that all the butterflies come off one small side branch of the tree. If you go to the Lepidoptera page of the website Tree of Life, click on Neolepidoptera, and then Ditrysia and you’ll finally see that the butterflies are all in the Papilionoidea, which is just one of 126 families in Lepidoptera. There are somewhere around 15,000-20,000 species of butterflies, out of a total of 174,250 catalogued species of Lepidoptera (moths and butterflies). So butterflies are a large group, but they are still a minority in the Lepidoptera. The truth is that the Lepidoptera is mostly about moths, with a colorful and interesting subset of butterflies. If you are looking at a moth/butterfly type creature, and you want to know which it is, two rules will generally give you the answer. Butterflies are active during the day and moths are active at night, and butterflies are every color in the rainbow, and moths are generally brown, gray or white. Use those two rules, and you’ll be right most of the time. But there are exceptions. There are moths that are active during the day, and there are beautifully colored moths. There are also drab- colored butterflies that are only active at night. The accurate way for us non-lepidopterists to make a determination is to look at the antennae. The antennae of butterflies are simple and thin, ending in a thicker bulb or club shape. The antennae of moths can be almost anything else, although most of them have a somewhat hairy or fuzzy appearance. 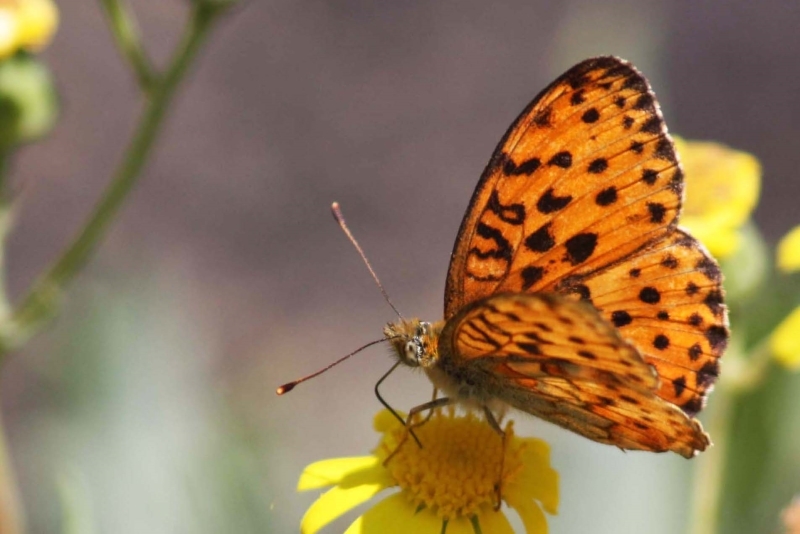 Moths, including the ever popular butterfly subgroup, are an evolutionary success story. Nearly one out of every five animal species that has been classified and described is a moth or butterfly. This percentage is almost certainly skewed upwards by the fact that these creatures are relatively easy to catch and catalogue, but still, there are a lot of moths out there in the world. Thanks to Ryan St. Laurent, at BugGuide.net for the ID on this moth (although, the BugGuide people warned me that they really only do insects of North America). Thank you to Dr. Richard S. Peigler at the University of the Incarnate Word in San Antonio, TX for his help with information on Titaea tamerlan. And thanks to Dan Janzen, biologist at the University of Pennsylvania, for his help and the great pictures of Titaea tamerlan larvae on his site Caterpillars, pupae, butterflies & moths of the ACG. Mora, C, Tittensor, D P, Adl, S, et al. (2011). How many species are there on earth and in the ocean? PLoS Biology, 9(8), e1001127. Cite this article as: Pelletier, TC. (May 13, 2014). What is this Costa Rican moth/butterfly? 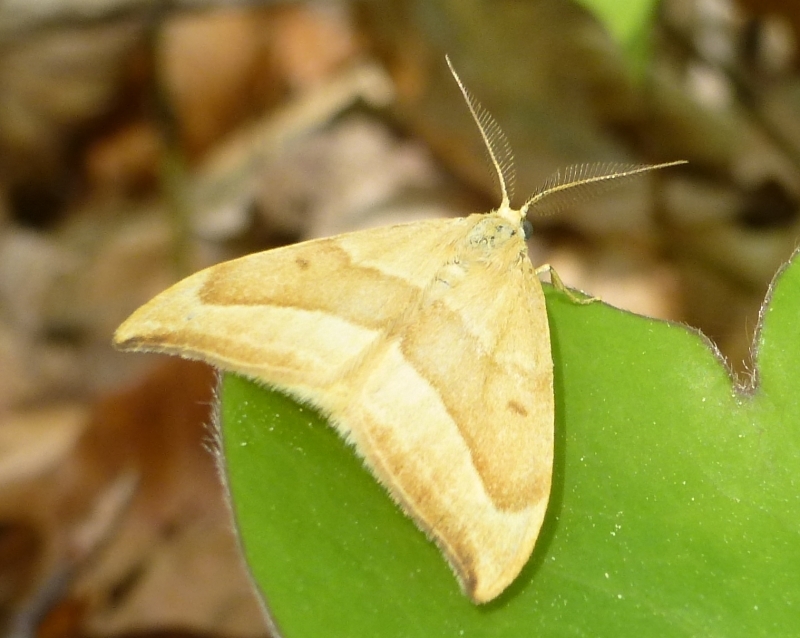 Retrieved from http://askanaturalist.com/what-is-this-costa-rican-mothbutterfly/ on April 21, 2019. Previous PostWhat are these jelly dots under rocks?Next PostCan I swim with beavers?